This is PART II of my interview with Cmdr. David Fravor. If you haven’t listened to PART I … go do that now. You need to understand who Cmdr. Fravor is, and the nature and historical importance of his UFO encounter. In this discussion, we get into the details. We talk about the different witness reports on the TIC TAC UFO encounter, and we talk about the nature of observation and how it can be flawed. This highlights the important role of a good investigator, and how event witnesses can’t be compared as “Apples to Apples”. Cmdr. Fravor even relates a couple stories that provide deeper meaning into the feelings he has on, why intelligent observation and study into the UFO topic is important. BREAKING: Formerly Secret UFO Program NOT Called, ‘Advanced Aerospace Threat Identification Program’ (AATIP)? 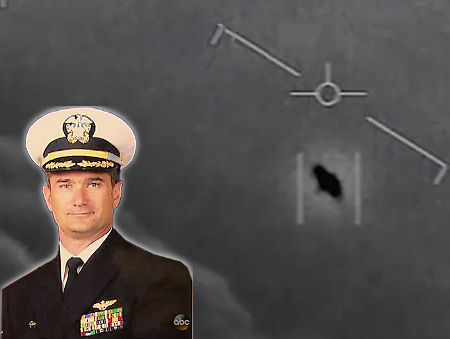 Navy F-18 ‘Gimbal UFO’ Video Explained? ‘The Pentagon’s Newly Revealed UFO Research Program’ – What a Week! Aliens, UFOs, Flying Discs and Sightings — Oh My!